Viewing – 12:00 p.m. – 6:30 p.m.
Interment will be in the San Francisco area. HIGHBRIDGE — The Rev. Wenzell Jackson, a Bronx church and community leader with a powerful singing voice and a knack for bridging divides, died of a heart attack Tuesday morning, according to his church. He was 47. Jackson was the chairman of Community Board 4 and, for the past decade, the senior pastor of Mount Hermon Baptist Church, where an impromptu meeting and memorial was held Tuesday evening. Tamra Jackson, the pastor’s wife of 24 years, addressed the stunned congregation there. Originally from San Francisco, Jackson arrived at Mount Hermon Baptist Church, at the corner of Nelson Avenue and 167th Street, in 2003. Members said Tuesday that he was well loved there, regarded as approachable and with a healthy sense of humor and sensitivity to the needs of young people. Dejinay Reed, 24, said he had helped her win a $2,000 college grant funded by the nearby Yankees and that he encouraged her and others her age to be active in the community. “I yearn to hear that beautiful voice (God gave you) sing ‘My Soul [Has Been] Anchored In The Lord,’ just one more time,” one person posted on Jackson’s Facebook page Tuesday. “Haven’t heard anybody sing it better,” another wrote. Jackson formed bonds beyond the church as well. Last year, he was invited to sing the national anthem at Bronx Borough President Ruben Diaz Jr.’s State of the Borough address. 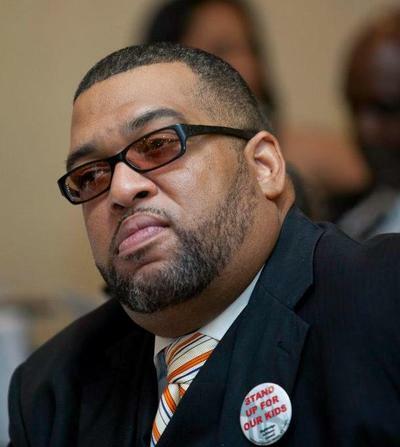 “Pastor Jackson’s passing is a big loss for The Bronx and the community he so strongly and passionately served as both a public servant and clergy leader,” Diaz said in a statement Tuesday. Jackson was voted chairman of Community Board 4 a few years ago, not long after the board failed to block the construction of the new Yankee Stadium atop local parkland, which many residents opposed. Some board members were still reeling from that ordeal when Jackson took over, according to the Rev. Earl McKay, a board member and the pastor at Church of God of Prophecy. “More than anything, I think he brought a great degree of calm and order to the board,” McKay said. Jackson also headed the 44th Precinct Clergy Council and organized a coalition of Highbridge clergy that met at Mount Hermon to discuss urgent neighborhood concerns, McKay added. He frequently dissolved into infectious laughter at community board meetings. Last year, he occasionally reported to the members on his weight loss — nearly 80 pounds by year’s end. Jackson’s disarming personality combined with his fierce commitment to the community made him a cherished leader who will be hard to replace, said Robert Garmendiz, another board member. “It’s going to leave a really big void for all of us,” he said. I am speechless…I happened to check your blog for the first time in a longtime and I’m met with the news of the passing of a close friend. Spoke with Pastor Jackson last Friday and of course never imagined that a few days later this would be our reality. I first preached revival for Jackson at the Tabernacle in San Francisco, CA during a time of transition for him and God merged our lives. Life is fragile and Death a stranger but our hope is sure We shall behold Him face to face. Thank you for your notice on Bishop Jackson. I was asked to come and stream the service in NY LIVE on the internet. I will be going over to the church on Monday to set up. I just watched your Bible Study from 2-5-13 and wanted to congratulate you on a tremendous job. Stay encouraged and be blessed. Where can we go to view the services online? Wenzell and I were Consecrated Bishops the same day by our organization and this is a tremendous loss for us. Many of us from Columbus, Ohio plan to attend and be present while our friend, colleague and Bishop is memorialized. I thank God his soul was anchored in the Lord. Is there anyway to get a copy of the service? I was there, but, upstairs with Kitchen duties- so I missed the service. I would suggest calling the church or Bishop Lewter’s church. Thank you for your inquiry and service in the kitchen at the homegoing of Bishop Jackson. Please be advised that the service is available on the internet TV website of Pastor Carl Washington and the New Mt Zion Baptist Church http://www.newmtziontv.com Also please know that after Wednesday of this week, DVD copies of the funeral will be available at New Mt. Zion Baptist Church. I am so humbled that I was able to participate (sing a solo) at his service here in San Francisco. It was an awesome celebration! On behalf of the Jackson Family we wanted to take the time to say “Thank You” for all your prayers, calls, letters of condolence, those who came from near or far to Celebrate the life of Bishop Wenzell Phillip Jackson. We thank and praise God for HIS keeping power as we continue through this transition. We have had celebrations in both the Bronx and San Francisco and God continues to be Praised! The College of Clergy represented and we say Thank You!! I pray that in this we learn a lesson as social media has caused detriment as my sister was away burying her nephew and and to hear of her husband’s passing through Facebook. In this instance, we as Christians should have awaited a directive from the family or church…. Knowing your intentions were well once again keep in mind 1 Corinthians 14:40!! Be Blessed and Keep us in your prayers! Thank you for your service in the kitchen during the homegoing of Bishop Jackson, we are sorry you missed the service. However, please be advised that his memorial service is available at http://www.newmtziontv.com Also please know that after Wednesday, DVDs of the service will also be available at the New Mt. Zion Baptist Church.